Marye’s Heights in Fredericksburg must have looked a lot like this on December 13, 1862 (except that it was swarming with Confederates). 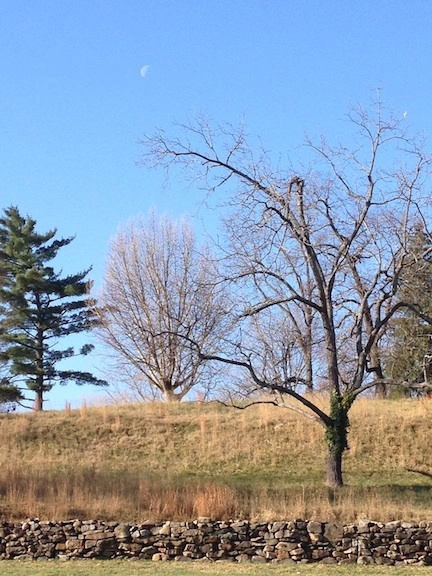 Recent landscape restoration at Fredericksburgs has returned the top the heights to its wartime appearance. Here’s what it looked like this weekend, during the 152nd anniversary of the battle. The infamous stone wall runs along the base of the heights; the sunken road is just behind the wall. Temperatures rose into the upper forties during the day—similar to the weather on the day of the battle. This entry was posted in Battlefields & Historic Places and tagged Battle of Fredericksburg, Fredericksburg, Fredericksburg and Spotsylvania National Military Park, Marye's Heights. Bookmark the permalink. My ggf, Americus Mitchell Gill, a private in Co. C, 13th Mississippi Infantry, was captured in the town fight on 12/12/1862, and missed the battle on the 13th. He was paroled and exchanged and was back with his unit by the middle of January. Back in 2002-3, I was honored to be on a committee of citizens, “viewers,” charged by the city of Fredericksburg to review and make recommendations on turning the battlefield portion of Sunken Road over to the Park Service (we recommended the transfer). While the city has grown into the battlefield, if you know enough, you can still get some of the feeling driving or walking up Lafayette Blvd from the river up to the National Cemetary. December, or anytime in winter, is the best time to visit this battlefield because the trees are shorn of leaves and you can see much more from different vantage points.